Here at Remix we’ve cooked up something a little different this week. Rather than providing you with goodies to kick-start the beginning of your week, we feel like a celebration of reaching the end of the week is in order. Has anyone ever congratulated you for making it to Friday? No? Well, let us be the first. It’s Friday, so swap the coffee for a glass of Pinot and take a moment to reflect on your accomplishments this week, as well as our dose of Friday Favourites to kick-off your weekend! We have fallen matte-ly in love with The Balm’s new Meet Matt(e) Ador – a matte eyeshadow palette featuring nine romantic shades. Grace your ‘lids with a pastel peachy-pink, or something a little sultrier like a rich, chocolate shade. With eyeshadow colours flirtier than your friend after a couple of wines, this is the ultimate addition to your make-up bag. Matte Ador is guilt-free being 100% vegan and cruelty-free. For tips on how to apply this eyeshadow to its best ability, head here. Say adios to stubborn blackheads, and hello to flawless skin with the use of FORMULA 10.0.6’s latest pore strip sensation. 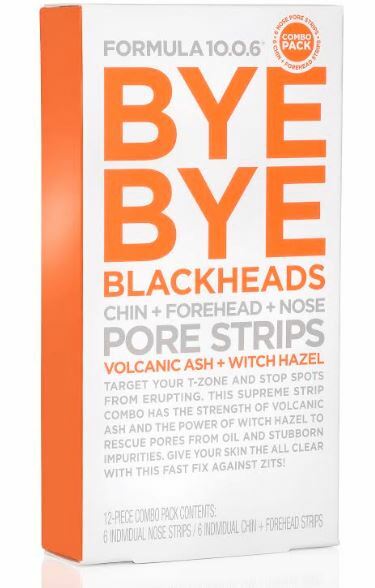 BYE BYE BLACKHEADS Chin + Forehead + Nose Pore Strips target those blackheads that find themselves just a little too at home in our skin. Within the formula, Volcanic Ash and natural astringent Witch Hazel allow the absorption of pore-clogging dirt, oil and toxins to cleanse and tighten our pores, preventing even the idea of a breakout from occurring. For only $14.99 and in as little as 10 minutes, these strips will effectively remove all signs of impurities, leaving your skin smooth and oil-free. Need we say more? Head to your local Farmers to purchase this gift from the skin-gods! The highly-anticipated range is finally here. You Are Here- Huffer’s Winter 17 collection, consists of oversized, cosy layers in warm fabrics so we can brave the cold in comfort. The new collection finds itself amongst dusky tones, deep maroons and bright blues whilst decked out in stripes and over-brushed cottons- there’s something for everyone. In the midst of the range is the Huffer custom print which uses the Google ‘YOU ARE HERE’ symbols and the Huffer three ball logo to combine the ultimate, iconic logo. Expressing yourself has never been easier with these garments that speak for themselves. Go check it out! Check out Huffer’s website for more. The seasons can take a toll on our hair- in Winter it may be left a little limp and in Summer the humidity can frizz our hair like there’s no tomorrow. However, L’Oreal Paris Botanists have whipped up a concoction called Botanicals Fresh Care, that entails precious flower and oil blends to nurture damaged hair. These precious oils are then blended with soy and coconut oils to leave hair nourished and soft. Depending on what TLC your hair needs, L’Oreal Paris Botanicals have introduced four luxurious ranges: Botanical Geranium Colour Radiance range for coloured hair, Botanicals Safflower Rich Nourishment range for dry hair, Botanicals Coriander Revitalizing Strength range for fragile hair and Botanicals Camelina Smooth Ritual range for frizzy hair. This fusion of nature, science and healthy hair reflects Botanicals Fresh Cares’ commitment to sustainability, collaboration and the community. So, go on, give your hair the guilt-free love it deserves! Available at supermarkets, pharmacies, The Warehouse and Farmers for $17.99. Head here to find out more about the Botanicals Fresh Care range. One of our favourite places in Auckland to food coma at, Orleans, has given us one more incentive to unbutton our pants for our food baby- a gigantic waffle stack. This dangerously-good stack of deliciousness consists of more than just their famous waffles. Throughout the stack, you will find fried chicken, tater tots, pork belly and bacon- all smothered in stringy cheese and some scrumptious gravy, along with a small patch of greenery- slaw. All this goodness is amongst a heap fries- just to top it off. Next cheat day, we insist you go all out! Check out Orleans’ menu here for more goodies. Witchery's white shirt can save lives. The campaign that takes action this month and next's is in place to raise awareness and crucial research funding to support the Ovarian Cancer Research Foundation (OCRF). Once established, it's significance in saving women's lives will increase. From April 6th to May 8th, each Witchery white shirt purchased will be completely donated (minus GST) to the OCRF to achieve this goal. To take part in this campaign, head here to purchase a shirt so you can wear it within these dates for support. You can also snap a pic wearing the shirt sporting the caption, "I wear a white shirt because..." with your own personal message of support. Then tag a friend to partake in the campaign!